"NYU is our Ahab bent on building as many mega-dorms as possible as they destroy our historical neighborhood, community, small businesses and push out our valued community members who can't afford their "high walls"/ tuition." "Economic Tsunami Wave of Over the Top"
There is way too rapid development of our historic community from 14th street to Rivington. Our Historic Buildings are being torn down, and our beautiful area is being blotted out by mega-dorms by NYU, Cooper Union, The New School and NY Law. NYU have mega dorms that blot out the beauty, history and bring mega-retail stores that close small businesses. Greedy landlords have jumped on the economic tsunami brought on by NYU, forcing out valued long term community members on 3rd and 5th Street and from 14th Street thru the Bowery to Rivington Street. We are looking more like a bad xerox of midtown every day. Save our neighborhood!!! Save CBGB's! NYU and all those that supersize in our 'hood should stop and start supersizing their contribution. NYU should give scholarships to our people that are excluded by their sky-high exclusive walls! NYU, NY Law, Cooper Union, and The New School all have dorms in the East Village but don't volunteer, tutor or help out enough. Instead, they blot out the sun with their mega-monster buildings and destroy our beautiful historic neighborhood. Small business are closing and more people are being forced out because of the over the top rapid development that shows no respect for our history and community. Many long term community people can't afford to live here or are being pushed out by greedy landlords/developer. My maternal Grandfather was born in a tenament house on Ludlow Street where now there is a parking lot and public school, rather then a megadorm. The newest small business to get the eviction notice is " The Whole Earth Bakery and Kitchen" at 130 St. Marks Place. Peter and his Mom have been there 15 years and are a 28 year old business. They are loved by the community and served us with healthy vegan food. Please do what you can to help Peter and his healing and community minded Bakery and Kitchen. NYU called a town hall meeting and they did not listen to a word we said. 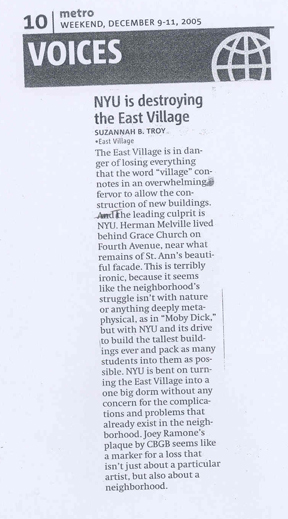 "No more mega dorms in the East Village!" NO to a 26 story mega dorm on St. Ann's grave which was mysteriously not landmark protected. My windows have looked out on 12th Street for 18 years and the noise levels are unliveable. We already have The New School Mega dorm on 12th Street a stones throw away from where NYU want's to add a mega dorm. Our street is like an all night entry and exit for all the mega dorms and way too many bars plus Webster Hall so a Friday night can mean massive horn honking, stereos blasting, people yelling and screaming as they exit bars and they also our street as a urinal so no more dorms as we have way too many around us already! They did not tell us they were not going to budge in inch or a "story" of their 26 story dorm to be on St. Ann's grave. NYU did not mention they where planning to build even more mega dorms around us on 13th St. between 3rd and 4th Avenue and 10th St and 3rd Avenue and another nearby. NYU has dropped any plans to expand NYU-Ville housing to 10 and 3rd Avenue. NYU's logo should not be the historic Washington Arch on Washington Sq. Park where of course they have uglified the historic area but NYU's logo should be the Palladium dorm with a dollar bill so they can reflect their true concerns and still use the image of our first President of Our Country. NYU's message to their students is zero respect for our neighborhood, the people of the community and the historic buildings and landscape of the entire area --- message -- nod your head and do not listen. Please visit our area and walk from 14 to Rivington thru the Bowery by CBGB's which is soon to be made homeless by a mega-bucks foundation that pats itself on the back at the Rainbow Room. 311 calls are like a vote --they are also a statistical report so make your voice heard. Stop NYU from further Supersizing the neighborhood! All these that supersize stop now and supersize your contribution to preserving the beauty, history and people of our community from 14th Street on down or you will have to visit Las Vegas or a museum to see a model of the Village/East Village, Bowery and Lower East Side!